For Samantha Treloar, cars have been a significant part of her life, and her superb taste in motor vehicles started at a very young age. Her efforts to follow her heart, be an individual and, stay family orientated within the car scene is highly commendable and something to inspire other women who want to build their own dream cars. “Growing up I was surrounded by cars and my family was always restoring all sorts of vehicles. It was an interesting childhood for me – instead of playing with hair and makeup like other little girls, I was helping my dad in the garage sanding panels and playing with grease. I didn’t want to do the ‘normal’ stuff like other kids; I wanted to spend time with my father and be involved in the car stuff. My pop (the late) Peter Zeck, used to rebuild hot rods and many of those cars are still currently showed at shows all over Perth, which is a lasting reminder of his work. One of the most important and influential moments I remember from my youth was watching my pop working on his ‘32 Ford 5 window coupe. He was diagnosed with cancer and unfortunately declined rather rapidly and was unable to finish the hot rod by himself, but our family and his friends from the hot rod industry came to his aid to complete the car, and he at least got to ride in his pride and joy before passing. That moment really taught me how cars can bring people together and the value a car can have to a person” Sam said. “My father took after my pop obviously, and he always had a project of some sort on the go in the garage – mainly old Holdens back then. He is still building cars today and has almost completed a 1956 RHD 210 Chevy which is soon to be on the streets. It will be great to see it on the road and be able to cruise alongside him” It was inevitable that after being surrounded by all of this car building, it would rub off onto Sam and it wasn’t long before she wanted to get a car of her own. “When I first got my license, I started my own social car club for people wanting to learn and help others, and mainly because at the time my daily driver was far from anything special, I wasn’t able to join any car clubs. Some great friendships and memories were made during that club’s time. I picked up an HZ Sandman panel van which became my own project for the next few years, but after losing all motivation for it, I sadly handed it over to my father who completed it” This experience didn’t stop Sam from enjoying cars though, quite to the contrary. Her interest and tastes developed and soon she was embarking onto another special phase of her life. She turned a friendship into a relationship and eventually into an awesome marriage, with a high school friend – her now husband, Luke. 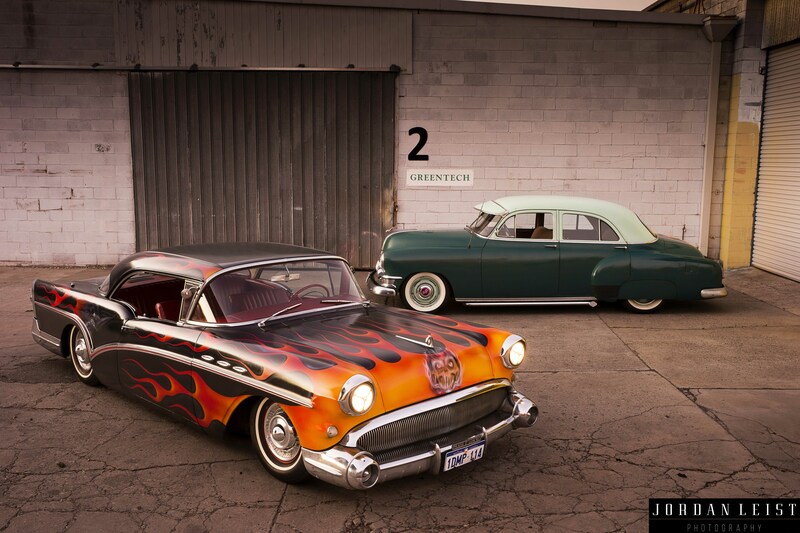 The pair obtained the ‘57 Buick back in December 2010 of a friend who had it sitting in his shed for around 12 months, but before that, the car originally came over from the eastern states. The previous owner in NSW, Sasha Mielczarek, sourced the car out of Connecticut USA back in 2006. Sasha instated Camden County Customs to weld in new floor pans, the tailshaft tunnel and a four-link rear end. Then came the airbag suspension and that sweet flame job over the satin black. The Buick runs a standard spec 350 Chevy backed by a Turbo 350 box – it is more of a cruiser than anything else. Inside the cabin is a red tuck and roll trim job in leather. “Luke painted a custom red, metal-flaked steering wheel, which was his first attempt at spray painting and he did an amazing job, it is something I am very proud of. It looks great in the car” During the years of ownership, the pair have rebuilt the brakes, fixed the airbag suspension, and made some minor beautifying adjustments. Even though the Buick is close to her heart, Sam still thinks about other possibilities. “I would love to get a hold of one of my pops hot rods. It would be a real honour to have one in our collection. My dream car though would have to be a ‘49 Mercury lead sled. Something about them just ticks all the right boxes for me – one day maybe” Sam laughed. All in all, Sam has been blessed to have such a great upbringing in the car scene surrounded by her family and husband. Her passion, unique taste and great attitude are precisely what the car scene needs to keep improving. That’s a sick car! Thanks for the read! !